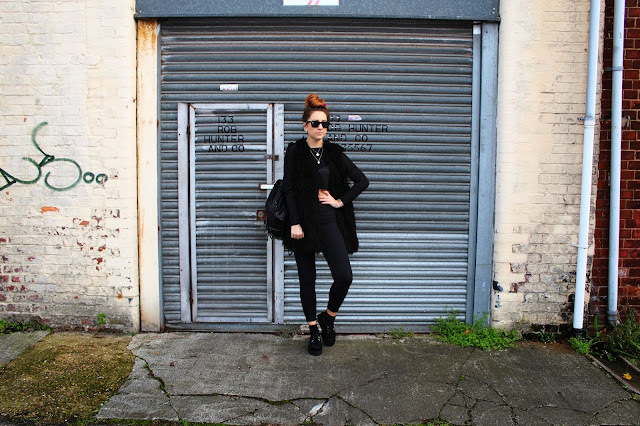 Style Crescent: OOTD: Faux Fur and Creepers. OOTD: Faux Fur and Creepers. Joni Jeans - Topshop / Crop Top - Primark / Faux Fur Gilet - H&M / Rucksack - Primark / Creepers - Primark / Tartan Scrunchie - River Island. beautiful! totally my taste of style! love the all-in-black look- and the silver necklaces are such a highlight! Love this look. Your hair is amazing!